I saw this book being raved about on Facebook (and subsequently as a Richard and Judy Book Club book) and so thought I’d download it. It seemed particularly poignant as a Dad in my daughter’s class at school had recently died – albeit after an illness and so not suddenly – but I still thought it might be relevant and give me an insight into someone being a young widow. Despite being such a difficult topic – I really enjoyed reading this book, and couldn’t wait to get back to it. It was so well written – and I can imagine being a mate of Lucie’s. She writes amazingly – and I hope goes on to write more after this first book. She deals with the aftermath of her husband’s sudden death – and the effect on her, her young daughter (the same age as my youngest child) and her friends and family with great emotion and passion – but also with humour and irreverence. Whilst it is written in her context – losing a husband very suddenly – I think it is relevant to anyone going through the hideous emotions of grief. And whilst I sincerely hope it’s not something I have to go through in the near future (the fact her husband is ‘Mark’, like mine, added an extra dimension) -I also hope it’s given me more empathy for people going through this, or similar, traumas. 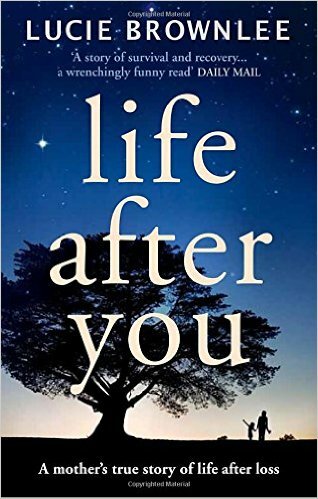 I would definitely recommend this book to anyone (and it’s alter ego version ‘Me After You’). It makes me very grateful for my Mark and our brood…….